There was a really cute coat that I fell in love with while visiting Whistler, B.C. in September. It was a raincoat by Helly Hansen with simple lines in a soft olive color. Not that I needed another raincoat. By my last count, I own one yellow, two black, and one brown raincoat and two rain jackets. That is more than enough for rainy Portland. So, why was I even looking at raincoats? Poor planning. It was pouring rain everyday while I was in Whistler. I had ignored the weather forecasts thinking it can’t rain everyday. I simply was not prepared for all of the walking in the rain that I would do in this charming resort. Because I had packed the wrong coats for my stay, I was either wet and freezing in a down vest over a long tee shirt or roasting in a full-length North Face down coat. Conveniently, there was a Helly Hansen store on the ground level of the Westin Resort where I was a guest. The American dollar was strong against the Canadian dollar. Plus, there was a sale in progress- one of the perks of vacationing at the end of the season. It was a simple equation. 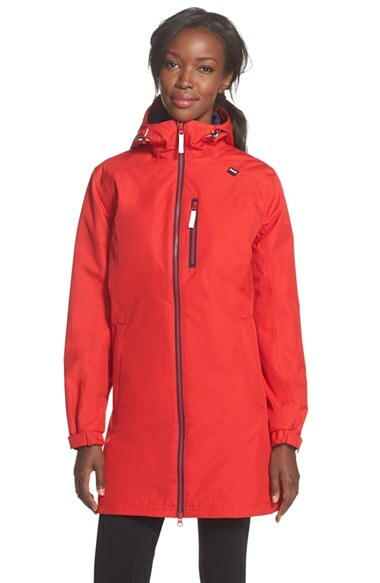 I need a raincoat and the price was right for a charming, versatile Helly Hansen raincoat. So, what was the conflict? I could not bring myself to buy it partially because of some feeling that I should not reward my poor planning with a new coat for a seven-day stay. I should tough it out. Also, I don’t like to think of myself as a spendthrift. I abhor mindless consumerism and did not want to make a frivolous purchase. There was another deeper reason for my upset. As a widow, I am sometimes plagued by feelings of economic vulnerability. My single women friends and I have discussed this many times. We are hesitant to toss something we no longer need nor want for fear that we may not have the money later to replace it. We also deny ourselves new things because of this same sense of economic insecurity. No matter how much we earn or have in the bank, we still feel a little shaky going it alone. I wished my husband had been there. “Why spend seven days of your vacation in misery when you can solve the problem with a new raincoat?” he would have argued. In doing so, he would have helped me confront my irrational fears. I did not buy the coat even though I walked through the shop everyday. Upon my return to Portland, I later bought a different Helly Hansen in bright red. I love this raincoat and enjoy wearing it. It is the coat I did buy. Posted on November 7, 2015 November 9, 2015 by lorigreerPosted in consumerism, securityTagged woman. Previous Previous post: Reading, Eating, Conversing Italian Style! I did not know you are a widow, I am so sorry… I read your posts and are somehow sad.. it saddens me as well.. Writing about my loss is therapeutic. I hope to be an example to my sons and to others as they experience loss or difficulty in their lives. Your comments are sweet and much appreciated. Hi Lori, in South Africa we are currently experiencing one of the worst droughts ever so after reading this post I wish we could get a little rain down here in the south 🙂 I have never bought a rain coat so I love this post, it is very nostalgic. Transports me to that moment when you first saw the coat.